Please note, Asia de Cuda has now closed. Time Out Food editors, March 2019. The culinary focus at this good-looking dining spot at the St Martin's Lane Hotel is, mostly, a fusion of Chinese and Cuban flavours. It's a cuisine that was borne from Chinese migration to Cuba in the late 1850s, to work in the Cuban sugarcane fields. It's still going strong in Havana's Chinatown. The dinner menu here features dishes such as crispy wonton served with Spanish olives, currants, toasted coconut, almond and avocado ceviche, spring rolls filled with slow-braised short rib and sweet and sour chilli, chipotle-glazed tofu, and swordfish served with vegetable escabeche, yuca dumplings, bok choy, toasted garlic and a spicy shrimp coconut curry broth. Tasting menus, bottomless brunches, bento boxes and an Asian-influenced Sunday roast also feature. After so many years I keep coming back. I enjoy the Cuban-Asian fusion, and they were the precursors to the 'fusion trend'. The crispy calamari still my go-to salad of the decade. Great atmosphere and service. Fantastic location in the middle of everything. My Favourite restaurant in London. I recently visited Asia de Cuba for the second time with my mum as it was a special occasion and I knew from previous visits that it was a great place. The services was excellent and very quick and the food was also excellent. I shall defiantly return soon and considering the afternoon tea option as we saw other people enjoying this option and wanted to try it out as well. It's been a decade since I last went here. Food is good as I remember along with the price tag! However, there is 50% off food throughout all of August so definitely worth a try. The coffee crusted steak was so tender with subtle aromas of coffee, like eating meat in a coffee shop. Wheelchair access ✔️. Staff were ever so friendly and helpful. Very cool place for a meal. Asia de Cuba – a taste of fusion in the most random location! The menu is so exciting – so extensive and featuring a range of Chinese/South American fusion dishes, which all sounded amazing. Thankfully we all opted for different small plates to start and share. – Highlights were the cheesy black bean empanadas, the flavoursome salmon ceviche, and the shrimp churros, which were perfectly crispy on the outside and went so well with the accompanying sauce! The vegan Pad Thai was actually a popular choice on my table, but the flavours of my Mojo Duck Confit, though tasty, just reminded me slightly of a posh Chinese takeaway dish unfortunately. The crispy bits of duck scattered around the plate, plus the runny duck egg were it's saving graces however! Portions for all of these were amazing, so you will definitely not leave hungry. Finally, we found it in ourselves to try some desserts – the tres leches cake was a bit strange for us and didn't exude the chocolate flavour we were hoping for. However the guava whipped cheesecake was amazing, and also enough for three people to happily share. Overall, a really interesting experience and the variety of the dishes themselves was awesome. However, I think it didn't live up to the expensive price point (at average £24 for a main dish.) I'd go back for one of their set theatre menu offers to try a little more of the menu. The food was filling and good but at the average price of ~£25 per main, I must say I expected more. The restaurant is deceivingly large, easily catering for at least 40 covers I'd say; the tables are set out very cleverly in a way that make it seem open and spacious and the decor makes it feel very comfortable, if not almost homely with plenty of framed photos, books and posters. This is in stark contrast to the hotel lobby which is vast, vacant and cold...guess they were going for a clinical Hollywood look. The toilet however is a tad confusing as the doors are made to look like the walls so I know myself and friends all had a chuckle over getting completely disorientated and temporarily stuck on our respective visits. The staff were all very friendly and helpful; they wasted no time in walking us through the menu, sharing their recommendations and bringing us our food and drinks. And here we are...the food. Let me start by saying that the menu is impressive; not only is there an ample choice and variety of dishes but they have also done an incredible job in describing each dish in such a delectable way that it made choosing very difficult! We got a few starters to share between the four of us which included the shrimp churros served with sesame, jalapeño and thai coconut curry, the black bean and plantain empanadas and the grouper ceviche. Each came as a hefty portion but it was only the ceviche that stood out, with the others being tasty but average and could, in all honesty, have been served by a low-end chain restaurant. For the mains, we went for the coffee crusted steak, seven-spice chicken and the scallops and again tried a little of each. The meat dishes were good but again, nothing overly special but at £29 and £25 respectively, I feel like they should have been memorable. The scallops on the other hand were absolutely delicious; a generous portion served up with tastetastic black rice, black beans, roasted cauliflower and japanese aioli. Which just leaves the dessert for which we all shared a portion of the Mexican doughnuts with caramel which I must admit were incredible: fluffy, warm and pleasantly stodgy. So all in all, I'm going to give this place a 3/5 stars; after all you go to a restaurant for the food and, be it poor choices or not, the quality and flavour of the dishes just did not live up to the price tag. Overall I'd say it was an average experience and one I'm in no hurry to repeat. 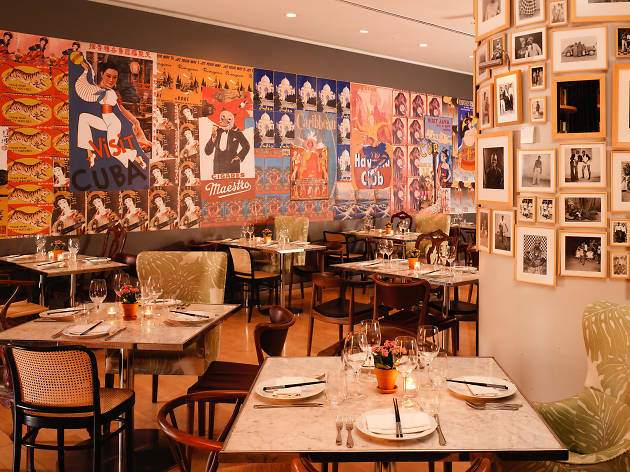 Hidden inside the St Martin hotel, expect to find this Cuban inspired restaurant. 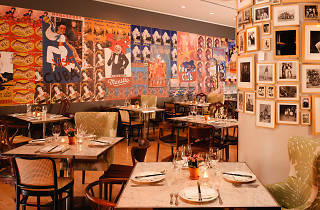 With its vast array of portraits and eclectic ambiance. Having heard and read the great reviews, I was looking forward to the bottomless brunch which included unlimited mojitos, mimosas, bellinis or bespoke bloody We had shared starters of shrimp churros, black bean hummus with malanga chips & plantain chips, ceviche de pescado or mushroom ceviche, chicken chicharrones, ropa vieja spring rolls, slightly over fried, the taste of shrimp completely lost. The ceviche was definitely the high of my meal. The mains were extremely disappointing and some of the worse food I have eaten, my duck confit salad was dry and combined with the brown rice it was heavy and flavourless . The squid salad was dry and chewy, both tasted rather stale. The Mexican doughnuts were very doughy, sweet fillings that were sickly but tasty. Service was fast, friendly and drinks flowed throughout the two hours at 15% service I would have expected it. The food was a massive let down and definitely not a place I would choose to spend my money at. Ok before I start, I have to say normally I would never opt for a chicken burger; I’m all about da beeeef. So one Sunday evening myself and a friend took a short trip down to this place after having heard a few people raving about it. We did not make a reservation, it was a late Sunday night, wouldn’t be needed right? Wrong, the place was mobbed! The restaurant itself is small, but filled with such a buzzing and trendy atmosphere; really great service too, after a short wait the manager was able to squeeze the two of us in. The chicken from starter to main was literally woah, so good. I’m going to share the order we put in, but first please make sure that if you do pay this place a visit, arrive starving, save yourself! To start we placed an order of the sticky disco wings to share, these were literally finger licking good; this was a perfect starter for us both, cooked perfectly with the right amount of seasoning and stickiness. For our main courses we ordered two of the bun burgers; this was due to us being visually won over by every plate going past us. After a short wait this mammoth of a burger was placed in front of our eyes; with a side order of fries, picked watermelon (wow) and a range of sauces. This burger was incredible, so many flavours burst through with every bite. I actually have no complaints to make about the burger, I can moan at myself for being such a wimp and not being able to demolish every single crump; it was just so big. I have to comment on the pickled watermelon, I have never and not since tasted something like this, so tasty and so refreshing; I would definitely recommend adding this to your order to experience the uniqueness. Unfortunately neither of us were drinking that night, school night and everything, but when I do return I will be hitting up their cocktail menu like cray. Ever in Haggerston or Seven Dials go in, wait if need be; just prepare for the chicken baby belly coming your way. Back to my first comment, I have never since looked down on the sweet baby chicken burger again. I love the decor here, especially the book case! Asia de Cuba is a fantastic restaurant for a special occasion or catch up meal. I went with a group on a training course and they were great with dealing with a large group and dietary requirements. They made special vegan dishes for me which were delicious! Dishes included an avocado salad, tofu and black rice, tofu spring rolls. I was really pleased with my experience here. This is one of my go-to places for an extra special dining experience. It’s certainly got the wow factor in a lot of ways – the décor is plush and pleasingly OTT, while nothing groundbreaking it does what it does well. Asia De Cuba was one of the London trailblazers in the now ubiquitous shabby-chic-warehouse-urban style of so many bars and restaurants, with mismatched chairs and eye-drawing objects. The food, while not perfect, is excellent. Each time I’ve tried the set menu on offer as it changes (and is less eye watering then the A la carte options) and I’ve never been disappointed. Quality fusion food, while not as unique as it was once when Asia De Cuba first opened, is still refreshing and exciting. The deserts in themselves are worth a visit – with hot chilli chocolate doughnuts a firm favourite. The service is friendly, the atmosphere and clientèle mixed but cool, without being unbearable. It may have been around awhile, but it’s a classic for a reason. really amazing place and food! I am not inclined to leaving comments on the internet, nor am I inclined to leave negative feedback, usually dismissing bad culinary experiences as either mistakes, or as my own fault in terms of plate choice. I’d rather leave the criticism up to Gregg and Michele. But I'm afraid that my experience at this restaurant has compelled me to speak out. My lovely boyfriend booked us a table at this very nice and interesting sounding restaurant for my birthday yesterday and I have to say in all honesty, if you're thinking about doing the same, don't bother. The interior is beautiful - it's quite a large space, but the restaurant is set up thoughtfully so tables still feel intimate. The service was attentive, friendly, and our waiter was knowledgeable. The food on the other hand... The menu reads impressively, and at the prices they charge, you would expect it to be. We were advised to share a starter and dessert as the portions were on the large side, so we shared a starter of beef carpaccio Thai salad - an enormous pile of leaves (mostly spinach) hiding maybe 3 at most slices of tasteless sliced meat, a quarter of an avocado, and quite a nice and spicy dressing. It was filling, but at the end of the day, it was just a bag of salad. For main, I had the coconut sea bass with crab and some sort of creamed corn cake. The tiny portion of fish was cooked to perfection, but I could barely taste the coconut. It was surrounded by nuggets of various vegetables (courgette, carrot, something else equally bland), a large tasteless white wafer that seemed to have no purpose other than decorative, an artistic dash of sauce, a measly sprinkling of crab, and THAT creamed corn cake. The cake had the texture of slightly wrong undercooked batter, though with less flavour. I almost instantly regretted putting the fork in my mouth. My boyfriend ordered the 'chicken milanasia'. Again, it read impressively, and again, it was an enormous let down. Firstly, it arrived at least 7 minutes after my main arrived. When it did finally appear (after a sort-of apology: "It is usually meant to share so takes longer". At no point had we been told this nor was it indicated in the menu), my first thought was that they had misheard 'chicken' for 'giant plate of salad'. Beneath the pile of undressed leaves was an enormous, flattened and breaded chicken breast, surrounded by globs of pesto. It was just incredibly bland. We also ordered ‘steamed Caribbean and Asian vegetables’ to share as a side. The broccoli, baby sweetcorn and mangetout were crisp and sweet, but they were drowned in a sickly soy sauce type dressing. If they had come as part of a supermarket Chinese ready meal, I wouldn’t have been surprised, but at a restaurant claiming to be of this high standard? No thanks. Thinking no one can get puddings wrong, we opted to share the ‘Bay of Pigs’. This was advertised as chocolate and vanilla ice cream with a chocolate brownie, caramelised banana with plantain chips and dark chocolate and butterscotch sauce. If you asked a five year old to make their ideal desert, the ‘Bay of Pigs’ would be it. It was entirely covered in whipped cream, and had two enormous, burnt tasting, honeycomb tweels stuck in the top – I’m assuming the only purpose of all this was to cover up the measly offering underneath. The brownie was unwieldy in the mouth, as dense as they come, and the ice cream, chocolate and butterscotch sauces, and mini marshmallows scattered around the plate were so synthetic tasting I wondered whether they employed any chefs at all, or whether they had just ordered take out and plated it up before bringing it to us. I’m really sorry to have to be so negative about it, but it was the kind of place that you leave wanting to warn everyone else in the queue to run for the hills (or just go to McDonalds). In summary, the atmosphere, service, and interior design are great. The food is massively overpriced and a huge disappointment in every aspect: flavour, appearance and portion size.